The doctors here at Regional Eyecare have extensive experience in the pre-operative evaluation and post-operative care of LASIK and other vision correction procedures. If after the pre-operative evaluation, the decision is made to proceed with surgery, your information will be forwarded to the surgeon, a pre-surgery consult with a surgeon will be scheduled. Post-operative management will be provided by our doctors and includes multiple visits over a period from the date of surgery to include medical evaluation and management of the vision and corneal healing. Evaluation of any additional needs such as reading glasses, sunglasses, or enhancement laser procedures is also included. You might be asking what is LASIK? LASIK is the most commonly performed refractive surgery procedure. You may hear people calling it "LASIX," but the correct name is LASIK, which is short for "laser-assisted in situ keratomileuses." Optometrist, Dr. Ryan Read had LASIK performed at TLC Laser Eye Centers in Chesterfield, MO. 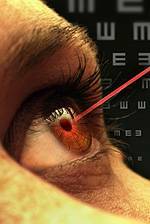 Optometrist had LASIK performed at TLC Laser Eye Centers in Chesterfield, MO. Here's what Dr. Toebben, an optometrist at Regional Eyecare Associates had to say about his LASIK surgery, performed at TLC Laser Eye Centers in Chesterfield, MO. Optometrists have LASIK performed at TLC Laser Eye Centers in Chesterfield, MO and tells us all about it! Tired of keeping up with having to continually update your eyeglasses prescriptions and the hassle of keeping, cleaning and storing your contacts? If you're looking for the best way to finally get rid of your eyeglasses or contacts once and for all, we're the practice to come to!